Parts and Plans are easily confused when talking about Medicare to people who have never dealt with it before. The main reason is that there are Medicare Parts A through D, but the Medigap Plans also use letter designations starting with A and going through L. The parts and plans of Medicare could have been setup in a better fashion, but then again the whole system was set up by Congress! So let’s try to make it a little simpler to understand. The PARTS of Medicare is in reference to the different PARTS of the Medicare program. The Medicare PLANS are referring to insurance PLANS that cover the gaps in Medicare. These lettered PLANS are known as Medicare Supplements, or Medigap, plans. The Medicare system is divided into 4 parts. These four parts refer to the different divisions of the Medicare program. Part A and Part B are funded by the Medicare program. Medicare does not cover all of your healthcare costs. There are gaps in the coverage you receive from Part A and Part B. This is why it is important to get some sort of coverage for those gaps. Some people can stay on their employer or retiree group coverage, although more and more retiree plans are pushing people out onto Medicare with supplemental coverage. But most people purchase their own individual coverage to cover those gaps. Part C and Part D are covered through private insurance companies, although Medicare maintains oversight over these plans. Part C – or Medicare Advantage – is set up so that Medicare subsidizes the insurance company to provide the coverage for you. Some Medicare Advantage plans have premiums and others do not. It depends on how each insurance company has determined to use the funds they receive and how they set up their networks and plans. All of them have restrictive networks, as well as deductibles and co-payments that you will pay each time you receive services from a healthcare provider. We have seen networks as small of 250 providers to having thousands, so be sure to check where you can receive your services. Some Medicare Advantage plans have premiums and others do not. It depends on how each insurance company has determined to use the funds they receive and how they set up their networks and plans to reduce their costs. All bills and claims are handled through the insurance company that you have your Part C coverage through. Every Medicare Advantage plan has restrictive networks, as well as deductibles and co-payments that you will pay each time you receive services from a healthcare provider. We have seen networks from as small as having only about 250 providers to having thousands, so be sure to check where you can receive your services. If you have certain healthcare providers that you like or want to use, be sure to find a plan that they participate in. Otherwise, you may have to pay out of pocket or find a new doctor. There are also limitations if you travel outside of the coverage area for your plan. This includes traveling out of the country. Under Part D, also known as the Prescription Drug Plan or PDP, you pay a premium to the insurance company for your coverage. You will also pay a co-pay anytime you get a prescription filled. Some plans also will have a deductible (up to $400 annually in 2017). We recommend going with a PDP that has no deductible such as Silverscript who is owned by CVS/Caremark and has an extensive national network of pharmacies. Medigap or Medicare supplement plans are insurance policies that pay the gaps in Medicare Part A and Part B coverage. These plans are available in all 50 states. You cannot have both a Medicare supplement and a Medicare Advantage plan at the same time. You can only have a Medigap plan if you are still on Medicare Part A and Part B and have not replaced your coverage with a Medicare Advantage Part C coverage. You can disenroll from a Medicare Advantage plan and go back onto original Medicare during certain times of the year, which I cover in this video. If you are wanting to go back to original Medicare from an Advantage plan, be sure to check out that video or call us at 1-888-228-6119 so we can be sure that we the right steps to ensure you can get Medigap coverage before you drop your Medicare Advantage. You must have Medicare Part A and Part B to purchase a Medigap policy. You can drop your Medigap plan or change plans any time of year. Medigap plans are guaranteed renewable and cannot be canceled for any reason other non-payment of premium. Medigap plans cannot be canceled due to medical conditions. You cannot be singled out for a rate increase. Rates can only be changed for everyone covered on the plan you are on statewide. There are no networks to keep up with. Go to any doctor, specialist, or facility anywhere in the country. If they accept Medicare, they will accept your Medigap plan. Medigap plans only cover one person. Your spouse must have their own separate policy. During your one-time open enrollment windows, you have a right to purchase any Medigap plan that you want with no underwriting and no waiting periods. Your health status does not matter. According to Medicare’s Guide to Health Insurance, the best time to buy a Medigap policy is during your Open Enrollment Period. You can enroll in a Medigap plan up to 6 months ahead of your 65th birthday and your Medigap open enrollment lasts for 6 months from the day your Part B coverage begins. Because of the popularity of our video about how Medicare covers cancer treatments, we get a lot of calls from people that are in current cancer treatments. Those clients are able to transition smoothly onto Medicare during their Open Enrollment period and enjoy comprehensive coverage from day one because of this guaranteed acceptance period. You cannot be turned down nor charged an additional premium due to health conditions, medications, or any other pre-existing conditions. Once your Open Enrollment period ends, any company you apply to for Medigap coverage can accept you or decline you based on your health. This is why the Medicare handbook says your Open Enrollment period is the best time to go with a Medigap plan. An important note: the Annual Election Period every fall does not allow you to change Medigap plans with no underwriting. Some people believe this is so because of the heavy marketing of Medicare Advantage plans during the fall of every year. The AEP each October 15 through December 7 only applies to Part D drug plans and Medicare Advantage plan changes. Some people delay enrollment into a Medigap plan because they have group health coverage through an employer or retiree plan. Later when you retire or lose that coverage, you have the right to purchase a policy within the 63 days following the loss of your group coverage. The big difference between Open Enrollment and guaranteed issue is the timeframe in which you can choose coverage. Open Enrollment gives you 6 months; Guaranteed Issue gives you 63 days. Just like with Open Enrollment, the insurance company cannot deny your application for any health reasons if you are leaving under these circumstances. There are some other circumstances which create a guaranteed issue window as well, such as losing Medicare Advantage coverage when moving out of state or if your Medicare Advantage plan decides to no longer offer coverage in your area, which happens a lot. Guaranteed issue rules can vary by state, so be sure to check with us so we can tell you how it applies to your state. If you are outside of your Open Enrollment or Guaranteed Issue period, you can still apply for Medigap coverage, but the insurance company can choose to accept or decline your coverage. You will have to answer underwriting questions to determine your eligibility. Some companies are strict on underwriting. Others will accept more medical conditions that are either controlled or have not recurred in the last few years. If you are unsure, give us a call at 1-888-228-6119 and we can check your current health situation against the underwriting policies of all the companies to see where you might be able to fit with one of them. There is no charge for our service, and our 21 years of Medigap experience can help us know where to look if you have some health issues to consider with underwriting. There are 10 different Medigap plans available. The plans are lettered A-N. There are some gaps in the lettering because Medicare dropped some older plans that included drug coverage or duplicated other plans back in 2010. Here is the most important thing to remember when comparing Medicare supplement plans – they are identical in what they cover from company to company. If a company is selling a Plan F Medigap plan, it has to adhere to the standardized plan formula that the government has established through the Centers for Medicare and Medicaid Services. They cannot vary the coverage at all. The only difference in a Plan F policy from one company as compared to another company is the premium you pay, the underwriting involved as it can vary, and the agent who is helping you. A Plan F from Mutual of Omaha is identical coverage to a Plan F from UnitedHealthcare, Cigna, Aetna, or any other company out there. The plans are standardized by law for your protection. In the Medicare and You book which is printed and distributed by Medicare each year, it says (in the 2016 version it is on page 100), “Different insurance companies may charge different premiums for the same exact policy.” They have different premiums, but the coverage is exactly the same. Sometimes the premium difference can be more than $150 per month! The companies will base their rates on the underwriting required to be approved. If you have had health issues, it may be harder to get approved with a company that has a lower premium. Other companies may cost more but may accept more applicants including those with pre-existing conditions. Here is a chart that shows the different plans that the companies have to abide by. All companies must offer Plan A and either Plan C or Plan F. Other than that, they can choose what to offer their customers. Plan A is one of the least popular Medigap plans, accounting for only 2% of overall enrollments according to a report from America’s Health Insurance Plans. This report shows numbers from 2014 and is the latest report as of the time this article was written. The reason it gets so little enrollment is that it has the least benefits of any plan. This also means the premium for Plan A is very low compared to the other plans. One great benefit is that it does cover the 20% Part B co-insurance, which as we mentioned above has no limit on your out-of-pocket costs if you have no insurance. This makes it a good plan for those who cannot afford more expensive plans. For those on Medicare due to disability, Medigap Plan A is available in most states for those under age 65. So can enroll in Plan A during your Open Enrollment period once you qualify for Part B coverage under Medicare. One thing to be aware of – a Plan A for someone under the age of 65 on Medicare because of disability could pay as much as three times what someone over 65 will pay. The reason is that most people on Medicare due to disability are going to have higher amounts of claims, and that will push up the premiums of any plan. When those loss ratios are out of balance, the costs are passed on to you in the form of rate increases. If you are under 65 and on Medicare due to disability, it is the one situation where we definitely recommend going with a Medicare Advantage plan. Medicare Advantage plans have the same rates (and sometimes they have no premiums at all) for all ages. Then when you turn 65, you can use that Open Enrollment period that comes with turning 65 to move over to a Medigap plan with more coverage for much less than you will pay for Plan A when under 65. Here is where the confusion comes in for most people. Why the government thought it would be a good idea to parts and plans of Medicare both have the same letters makes no sense. Then again, we are talking about the government here! Medicare supplement Plan A is a Medigap plan to help offset the costs of Medicare. Medicare Part A is one of the divisions of Medicare to cover your inpatient expenses. Medicare Supplement Plan B, or Medigap Plan B, offers all the same benefits as Plan A with one addition. It also covers the Part A hospital deductible. In 2017, the Part A deductible is $1,316. This deductible increases each year. The Part A deductible is not an annual deductible. It covers you for a 60 day period of hospital care in a semi-private room. For example, say you are admitted to the hospital on January 1. Without a Medigap plan to cover the Part A deductible, you would owe the hospital that payment upon admission. If you stay for 3 days or for 60 days and then go home, you only pay that one deductible for your Part A charges in the hospital. Using the same admission date for the next example, if you go in for 3 days and then are discharged, but then you have to go back into the hospital 30 days later, you will not have to pay that deductible again. Your deductible you paid on January 1 covers you for 60 days. If however, you go into the hospital on January 1 and then have to be admitted again in June, you would have to pay that deductible again. Although I have never heard of it happening, in a perfect storm you could pay that deductible 5 times in a year! If you have a Plan B which covers the Part A deductible no matter how many times you use it per year, you would not have to pay that deductible at all. The benefits under Plan B are very limited. Plan B accounted for 3% of all Medigap plans in force in the report named above. There are far more comprehensive plans for a small amount of additional premium, so most people opt to go with one of those plans, such as Plan F or Plan G which we will cover in a moment. Medicare supplement Plan B is an insurance plan to offset the gaps left in Medicare coverage. Medicare Part B is one of the four parts of Medicare and covers your outpatient medical services. You must have Medicare Part A and Part B in order to have a Plan B (or any other Medigap Plan) to help pay for the gaps in coverage with having Medicare alone. 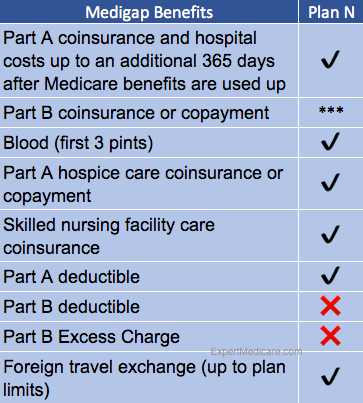 Medicare Supplement Plan C covers almost all of the gaps in Medicare as you can see in the chart above. The only item it does not cover it the Part B Excess Charges. Plan C accounted for 10% of all Medigap plans in force in 2014. Excess charges are surcharges that your doctor can charge above and beyond what Medicare will reimburse. They are limited to 15% above Medicare’s assigned pricing structure. Medicare has an assigned cost and a code for everything your doctor can possibly bill you for. The vast majority of doctors do not charge excess charges, but occasionally they do. If this concerns you, the Medigap Plan F might be a better choice for you. Medicare Part C refers to private Medicare Advantage plans, but they are not the same as Medigap plans. They are not supplement plans and cannot be referred to as such. Medigap Plan C is one of the ten Medicare supplement plans available to fill the gaps of original Medicare. If you buy a Plan C, you will enjoy the freedom of access top physicians and hospitals that you already get with Original Medicare, and you can also rest assured that your supplement policy is going to step in and pay for things like your inpatient and outpatient deductibles when you incur them. With a Medigap Plan C, you do not have to worry about doctor or hospital networks, or getting a referral when you need to see a specialist. With a Medicare Advantage plan under Part C of Medicare, those limitations (among others) will apply to your coverage. If you are still not sure of the difference between the parts and the plans, call our office at 1-888-228-6119 and we can help. The Medicare supplement Plan D covers all but two of the categories on the Medicare coverage chart. It does not cover the Part B annual deductible (which is $185 in 2019) or excess charges, which we covered under the Plan C above. Medigap Plan D does offer a lot of coverage compared to most other plans. We used to write a good bit of Plan D policies before Medicare restructured the plans in 2010. In 2014, Plan D accounted for 2% of all in-force Medigap plans. When the plans got restructured, the Plan D was not as competitively priced compared to other plans like the Plan G. But this past year we saw a couple of companies, including Aetna, that re-released the Plan D and the rates were very good in the states they are offering it in. In most cases, though, the Plan F and especially the Plan G offer more bang for your buck and offer more coverage. If you are looking into the Plan D, make sure you see how it compares to the Plan G and Plan F to make sure it provides the coverage you need compared to premium you are paying. This another one where we hear the plans and parts interchanged frequently when talking to people who call our office. Medicare Part D is the prescription drug program that Medicare offers to all beneficiaries. Medigap Plan D is an insurance policy to fill the gaps of original Medicare coverage. When you have a Medicare supplement plan of any letter you will still need to secure Part D drug coverage as the Medigap plans do not offer any drug coverage. Most Medicare Advantage plans do offer drug coverage as a part of their plans, but we have found that the coverage is less and the co-pays are much higher for drug coverage under a Medicare Advantage versus a Medigap plan with a separate Part D drug plan. Let us compare for you. There is no charge for our service! The Plan F Medicare Supplement is the grandaddy of them all. For many years it has been the top-selling Medigap plan, garnering a whopping 56% share of all Medigap plans in force in 2014. That percentage has grown as the same report from 2012 showed that percentage at 52%. One of the reasons for this is that as of the time of this article, some of the very large companies like UnitedHealthcare do not even offer a Plan G, which is a better value for the money as we talk about in this video. You have no out of pocket costs for any Medicare visits and procedures. Plan F provides first-dollar coverage. It is the most comprehensive coverage you can get under Medicare. If you go into the hospital for a knee replacement, it covers every Medicare deductible and co-payment from the first visit to the doctor, to the consultation with the surgeon, to the pre-op, surgery, and post-op, to the home health nurse visits, and all the way through the follow-up physical therapy! Nothing out of pocket for any part of that. Sounds wonderful! So how much does this amazing plan cost? As we mentioned before – all plans are identical from company to company. Yet, in most areas, we can see as much as a $180 difference in price between the cheapest and the most expensive companies offering the same Plan F.
It is important to know that if you have a Plan F on January 1, 2020, you can keep that plan as long as you want to. In fact, you can switch to another Plan F from a different insurance company if you want to after 2020 rolls around. Remember, the legislation only prohibits the sale of Plan F and Plan C to people that are NEW to Medicare after January 1, 2020. If you are eligible for Medicare prior to that date but you are continuing employer coverage, you will be okay. When your employer coverage ends and you switch over to Medicare, you will still have a right to enroll in Plan F.
If you are still on employer coverage and become eligible for Medicare after 2020, you will not have the same rights to a Plan F or C. At that time, your guaranteed issue rights will allow you to enroll into a Plan G or Plan D, which is something you cannot do as of the writing of this article. Is Staying On or Enrolling In a Plan F a Bad Idea Now? My advice is simple. As we. will get into in a minute in the Plan G section, the Plan G is already a better value today than the Plan F is. There are many reasons. First, people leaving employer coverage and going onto Medicare cannot go into Plan G on a guaranteed issue basis as of the writing of this article. They must pass underwriting to enroll in Plan G. However, they can go directly into a Plan F with no underwriting. This means that people that can qualify through underwriting are choosing a Plan G when they learn about what a great value it is compared to Plan F. Those who have ongoing health issues are going onto Plan F because it is their only option if they want comprehensive Medigap coverage. So here is that advice – if you are already on a Plan F and can qualify, go ahead and make the change now to Plan G. The savings potential under Plan G is great. People don’t want to switch to a Plan F once they see the savings firsthand. If you are looking to enroll in Medicare for the first time, go ahead and get an established Plan G while there is no underwriting required. When the various Plan F pools of insured people stop bringing in new, younger, healthier members, the premiums are going to start rising. Any health insurance plan needs healthy, young insureds to help keep the claims loss ratio lower. That is one of the biggest factors as to why Obamacare has failed. There weren’t enough young, healthy people taking the coverage. It was mostly those who already had medical conditions. The same factors come into play here. As we get older, we have more health problems, and thus more claims that must be paid. An unbalanced pool of insured members will drive up premiums on everyone on that plan. Once that starts happening, the ones that are healthy enough to get coverage elsewhere will do so. That will just exacerbate the problem. We saw the same thing happen when the Plan J was discontinued in 2010. There were a lot of people that had that plan because it had good drug coverage. And when the Plan J was discontinued, people could stay on it as long as the drug coverage was taken off the policy. I still have some clients that have Plan J because they cannot qualify to go elsewhere. Right now, they are paying almost three times what they were paying when they took it out because of the very reasons I just went through. There are no new healthy members coming into the pool of insured members to offset the increasing claims each year. The Medicare Supplement Plan G is the top selling plan for us at Integrity Senior Solutions. We created YouTube videos and articles about the value of Plan G, as well as making sure that everyone that calls our office understands how it works compared to the Plan F.
As we mentioned in the last section, Plan F is the top selling plan by far. Plan G was reworked under the Medicare Modernization Act of 2010. Before then, the Plan G only paid 80% of excess charges. That was changed to 100% in 2010. That means there is only one difference between the Plan F and Plan G – the Plan F pays the annual Part B annual deductible and the Plan G does not. That’s it. They are identical except for that one benefit. When we shop your rates with all the available companies in your area, we generally find that there is a substantial savings between the plans. The deductible you have to pay under a Plan G is $185 in 2019. The savings we find are usually way more than that amount. And you get to pocket the difference. With both the Plan F and the Plan G, that Part B annual deductible is going to get paid to Medicare. Under Plan F, your insurance company pays it for you. Under Plan G, you pay the deductible. With the Plan F being substantially more in premium than the Plan G, you are in essence paying the insurance company a convenience fee to pay that deductible for you. There is no reason to do that. Pay that deductible yourself once a year and pocket the difference. That money will do more in your bank account than it will by enlarging the coffers of the insurance company. Once you meet that annual Part B deductible, everything else is paid exactly like Plan F. That means no deductibles and no co-pays for anything once the deductible is paid. I won’t go into the details again like I did in the Plan F section about guarantee issue rights and losing employer coverage, but that factor is one of the reasons that Plan G has a much lower average rate increase than the Plan F from year to year. Our experience over the last 7 years since we started selling the Plan G is that average Plan F rate increase has been 8-9% per year, while the Plan G overall rate increase has been 3-4%. Some companies have maintained level rates on Plan G for two to three years at a time with no rate increases. I’ve given you a couple of great reasons in this section and in the Plan F section on why the Plan G is a better value. Lower premiums are great. Long term rate stability under Medigap Plan G is another great value. And that long term stability is especially important if you are coming onto Medicare with some health issues. Since you may not be able to switch companies down the road if you have some sort of negative diagnosis, getting locked in with a great plan with a low rate increase in a company with good financial stability is very important. We can see the rate history of every company in your area, as well as their financial ratings with companies that rate insurance carriers. Also keep in mind that with new enrollees not being able to enroll in Plan F after 2019 as we talked about in the Plan F section, getting onto a Plan G while you can qualify for one is important. Even better is that if you are on Plan F and switch now. if your Part B deductible has already been met for the year you don’t have to pay it again. Once Medicare gets their Part B deductible, you are done with it for the year. Ready to rock that Plan G? Call us today and let us check rates from all the carriers in your area. **Medigap Plan K has a $5,120 out of pocket limit in 2017. After you meet your out-of-pocket yearly limit and your yearly Part B deductible, the Medigap plan pays 100% of covered services for the rest of the calendar year. Plan K offers fewer benefits for lower premiums. You can still have important coverage like preventative services under Plan K, as well as the extra 365 days in the hospital. But on many of the Part A items you are going to split the cost-sharing with the insurance company at a 50% co-pay until you reach your maximum out of pocket for the year. Once you reach that limit, the Medigap Plan K will kick in and cover your expenses at 100% for the rest of the year. Very few companies offer a Plan K, but there are some out there and we know where to kind them. Call us or send us a message through the form to the right of this page to let us find the best rate for your situation. **Medigap Plan L has a $2,560 out of pocket limit in 2017. After you meet your out-of-pocket yearly limit and your yearly Part B deductible, the Medigap plan pays 100% of covered services for the rest of the calendar year. Just as with the Plan K, the Plan L is an opportunity to get a lower premium and take on more of the cost-sharing yourself. Instead of a rate of 50% co-pay as on the Plan K, the Plan L pays 75% and you pay 25% until you reach your annual out of pocket limit of $2,480. At that point, the Plan L will take over the rest of your Medicare deductibles and co-pays for the rest of the year at 100% coverage. You will also pay the Part B annual deductible and any excess charges that may come due. Like with the Plan K, there are not a lot of Plan L companies to choose from. But there are some good ones and we can find the best deal in your area. Instead of calling the 30 or so companies that offer Medigap coverage in your area to see who does offer Plan L, you can call us and we will shop all the available companies for you. Medicare Supplement Plan M is one of the most under-utilized plans available. I believe it is mostly because the cost-sharing aspects can be difficult to understand. Medigap Plan M has same basic benefits as other Medigap plans. But if you are willing to pay half of the Part A deductible and all of the Part B deductible and excess charges, you could find yourself in a situation where you can save significantly on premium. Most agents will not even suggest a Plan M because the premium is so low that they make very little commission on it. What kind of service is that? Because of the fact that most agents are not even showing it to clients, there are again only a handful of companies that offer the Plan M. But if you are willing to take on some of the cost-sharing under Plan M, you could save yourself a lot of money every year, especially if you never or rarely go to the hospital. It is a plan worth looking into. Medigap Plan N has gained a lot of popularity since first being introduced with the Medicare Modernization Act of 2010. For those who are will to take on the Part B annual deductible and some small co-pays, this can be a great plan with a much lower premium than Plan F or Plan G.
Medigap Plan is carried by a large number of companies, so finding a good company with a competitive rate is easy. We can help! Wow, that was a LOT of information! Did you read it all? Kudos to you if you did. You are now an expert on Medicare. Let me know in the comments below of any questions you might have. They are not going to shop your coverage around or tell you the prices of their competitors. They will not tell you if they have a rate increase coming up in the next few weeks. They will simply enroll you quickly and move on to the next caller in queue. They will not review your coverage every year to make sure you are still in the best possible plan. They will not handle any claims that don’t get paid properly. They will send you to customer service where you can hold on the line for minutes to an hour just to get through to someone who may have a bad attitude. We can take care of all of that for you. That is what we are here for. We VALUE our clients. We are a family owned agency with 21 years experience helping people with Medicare. Let us put that experience to work for you. Call today or use the form to the right of the page for your free quote.